Each year, the Alberta Fish & Game Association (AFGA) holds its conference and annual general meeting. This year, our club had enough members to send two voting delegates, and I was lucky enough to go. The first day of this conference, was Thursday February 21st. We got all registered and collected our sweet swag bags courtesy of the Calgary Fish & Game Association, and we headed in to the hall for the reports from the Environment Chair and the Programs Chair. The programs report offered some great insight into the different programs offered by the AFGA, such as the Becoming an Outdoor Woman Program (BOW) which is a multi-day camp offered to all ages of women to introduce them to things such as archery, firearms, and chainsaw operation. The report also gave an update on the Narrow Lake Conservation Camp, a camp for youth members who are sponsored by each local club to attend. They learn skills such as Firearms Safety, Hunters Education, and Boating Safety, since they go canoeing pretty much every day. It provides a major boost to engaging our youth across the province. The first night was the mixer, and this year they went with a luau theme, so everyone got in the spirit, got decked out in flowered shirts and got “lei’d” by the Onoway club as we walked in the hall. Many of the clubs generously donated some amazing food, and no Lu Au would have been complete without an entire roasted pig, presented to the crowd on a stretcher and carried in by a couple of dudes in full costume – which is exactly what we got. The evenings at conference are generally spent networking, something we did a ton of. Finding out what other clubs are doing, in my opinion, is the best part about conference. We got so many ideas to bring back to the club and met some awesome people who are doing some really great things for conservation in our province. On Friday we were lucky enough to have a number of speakers from the Provincial Government give some insightful and informative presentations, although the general theme when it came to questions was that with the looming election, what they could tell us was limited. Despite this, we learned quite a bit about invasive species in the Province of Alberta, the ongoing projects to monitor them, and what we can all do to combat their spread. Saturday, was arguably the most important day of Conference. After breakfast we filed into the hall to take our seats to get ready for the election of the new AFGA executive. After some speeches, elections were held and a new President and Vice President were installed. Following elections, we reviewed the resolutions drafted by each of the clubs in Alberta for consideration by the voting delegates. These resolutions range from asking the provincial government to allow hunting on Sundays in certain WMUs, to the responsible use of OHVs, to the management of feral horse populations. We went through each resolution and delegates were provided the chance to speak for or against each one before ultimately each was voted in or voted down. The reason this is so important is because it provides the members of the AFGA, the hunters and anglers in our Alberta, a collective voice that the government hears. The analogy that was used earlier in the conference, was by lighting a match and holding your hand over it. Definitely uncomfortable, but not nearly as uncomfortable as when you light an entire book of matches. The parallel being drawn is so true, our voices are much louder when we speak together in one voice – something that is achieved for us through the AFGA. That night at the President’s Ball, after the new Executive marched in to the live bagpipes, and after the new and past presidents did a shot of scotch together (as per tradition), and after the youth delegates led the room in the singing of our national anthem, we had a fantastic dinner, followed by example after example of extraordinary commitment to education and conservation as the awards were presented to the very deserving clubs and members across the province. It’s astonishing how much love and passion the members of these organizations show year after year, many of them for their entire lives, and it’s extremely motivating for me when returning to my own club wanting to make a difference, like so many before me. 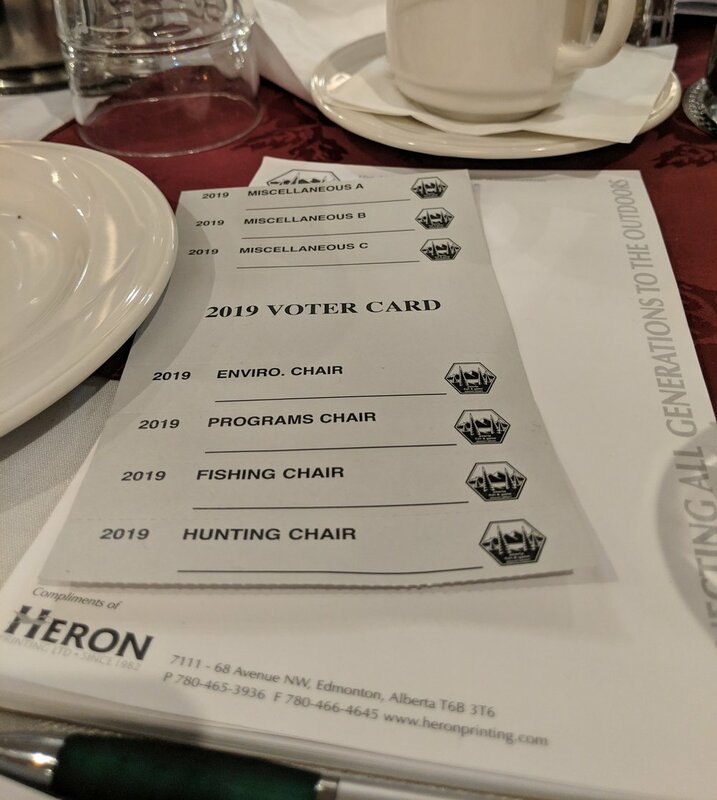 It was truly an honor to attend this year’s conference on behalf of our great club, and our club is already drafting our own resolutions to defend at next year’s conference with the hopes of improving the experiences for hunters and anglers in Alberta.